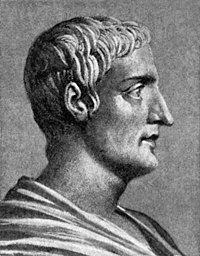 Hi Gaius Cornelius Tacitus (ha Kinatsila: Gayo Cornelio Tácito) nga kilalado ha halipot nga Tácito (56 – 120) usa nga historyano, politiko han manunurat nga Romano. Donald R. Dudley, The World of Tacitus, London, Secker and Warburg, 1986. ISBN 0-436-13900-6. F.R.D. Goodyear, The Annals of Tacitus, Cambridge, Cambridge University Press, 1981. Mary L Gordon, The Patria of Tacitus, The Journal of Roman Studies, 1936. Ronald Martin, Tacitus, London, Batsford, 1981. Ronald Mellor, Tacitus, London, 1993. Ronald Mellor, Tacitus' Annals, Oxford/New York, Oxford University Press, 2011. Ronald Mellor, Tacitus: The Classical Heritage, New York, Garland Publishing, 1995. ISBN 0-8153-0933-3. Clarence Mendell, Tacitus: The Man and His Work, Yale University Press, 1957. ISBN 0-208-00818-7. Oliver P. Revilo, The First Medicean MS of Tacitus and the Titulature of Ancient Books. Transactions and Proceedings of the American Philological Association, 1951.